OPAGAC has a long tradition of collaboration with Spanish scientific institutes and other entities, making available to scientists all information required for stock assessments of tropical tunas in the three oceans, and hosting research trips on board its vessels. All information regarding the activity of the OPAGAC/AGAC fishing fleet is available to scientists (logbooks, FAD diaries, port sampling and observer reports). The collaboration with the IEO dates from the beginning of fishing activities of our fleet in the ‘60s. Since then the collaboration has supported the work of the IEO on essential research within the RFMOs. Currently, OPAGAC/AGAC has signed a collaboration agreement with the IEO for volunteer observers to board our fleet as part of the 100% coverage by observers. The release of sharks from the net while it is in the water. Since 2014 the Tuna Strategic Plan, a joint initiative of the Spanish fleet with the national and regional administration, was designed with the collaboration of the General Secretariat of Fisheries from the Ministry of Agriculture, Food and Environment, the IEO, AZTI, ANABAC and OPAGAC. This Plan aims to unite the efforts being done by all participants and optimize the resources that are being provided by the public administration and the private sector. Project on new designs of FADs to avoid entanglement and the incidental capture of bycatch species, especially sea turtles, as well as exploring the possibilities of acoustic discrimination in the Spanish purse seine fishery in the Indian Ocean. For ten months, two purse seiners and two auxiliary vessels conducted fishing operations in a variety of new designs of FADs (22 different models) to prevent entanglement of bycatch species, especially sea turtles and did experiments with acoustic gear to establish criteria that could provide information for an eventual reduction in catches of juvenile tropical tuna (yellowfin tuna and especially bigeye tuna). 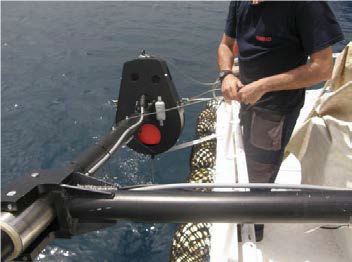 Depth sensors were installed on the nets and measurements were made throughout the deployment of the same in each set. Final results showed that there were no significant relationships between the depth of the net and increased catchability of bigeye, implying absence of bathymetric stratification in tropical species under floating objects. This project is the result of a joint collaboration between OPAGAC, ANABAC, ISSF, IEO and AZTI. The objective of this project was to use the entire network of FADs deployed by the fleet, as well as data provided by the buoys deployed in each FAD. They would provide a “snapshot” every certain period of time of the biomass of tropical tunas throughout the entire network of FADs in the ocean. In addition, the acoustic characterization of species obtained in earlier research could also be used to further refine these indices. This was a joint project with the IEO, IRD, ANABAC, AZTI, EUROTHON and EU. The main objective of CECOFAD was to determine how recent improvements in technologies and fishing methods can be integrated into the estimate of catches of species and their relative abundance. To conduct research activities needed to improve scientific knowledge in support of the sustainable management of tropical tuna resources and their marine ecosystems, as well as the responsible exploitation and competitiveness of the Spanish fishing fleet fishing these resources. To monitor the activity of the Spanish and associated tropical tuna fleet, and conduct studies on the biology and population dynamics in the Atlantic, Indian and Pacific Oceans that contribute to sustainable resource management to meet the requirements of tuna RFMOs in research and in the various scientific or research programs that will be established. Active participation in international fora for tuna management. In addition, the group, through participation in tuna RFMOs, provides advice to both the freezing tuna fleet that forms OPAGAC and ANABAC, as well as to the General Secretary of Fisheries and the European Union. A team of scientists (IEO-AZTI), leader in research of tropical tunas works in coordination, efficiently and transparently with active participation and presence in the Scientific Committees of the four Regional Fisheries Management Organisations [ICCAT, IOTC, WCPFC and IATTC], to improve scientific knowledge and provide scientific management advice aimed at ensuring the sustainability of tuna resources and activity of the Spanish fleet in the Atlantic, Indian and Pacific Oceans.